Successfully Added Deluxe Ultrasonic Cleaner (Jewelry, Collectible, Discs, More...) to your Shopping Cart. New model Ultrasonic Cleaner with stainless steel bowl for perfect cleaning of jewelry, watches, glasses and other valuables. Do you have a few favorite necklaces or watches that really need to be cleaned and polished, but you find yourself lacking the time to take them to the jeweler to have them properly restored to their original beauty? Well, no worries, with the Deluxe Ultrasonic Cleaner you can now take care of them in the convenience of your home. This model has one more special feature that makes it a bit different than other Ultrasonic Cleaners on the market today; you can also clean DVD and CD discs! That is correct, now you have a safe and effective way to clean spilled coke, jelly, or other hardened materials off the surface of your discs. How does this product work? This fantastic new high-tech product emits 42,000Hz of ultrasonic waves that clean almost any item in only THREE MINUTES. 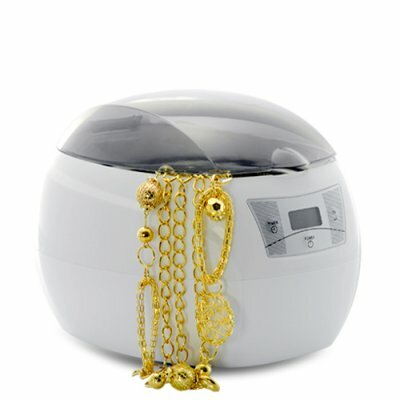 The Deluxe Ultrasonic Cleaner makes your necklaces, rings, earrings, bracelets, coins, eyeglasses, watches and much more look as good as new. Click "Add to Cart" now to have us instantly ship a sample of this unit to you today. Then order more to resell on eBay or your own internet storefront. It is brought to you exclusively by the leader in factory direct from China electronics - Chinavasion. 3 Min Auto Shut Off. Power adapter includes a 1-meter long cord. Also called a "bling cleaner" in the press. Do not use this with cheap CD-R's. This should only be used with store bought CD's and DVD's and name brand CD-R's and DVD-R media. It cannot remove scratches from discs, it only cleans the surface of high quality disc media..
You may add a small amount of mild detergent to help clean hard to remove grim. The constant high vibration water waves work to clean hard to reach and slick metal surfaces.